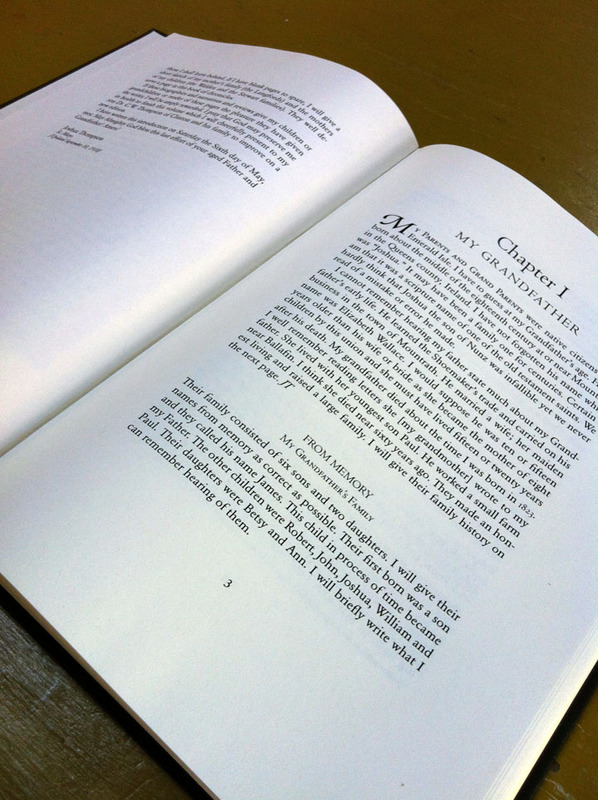 The Family History – typeset, printed and bound. As mentioned earlier, Joshua’s Family History has been transcribed, printed and bound into a new edition, with a limited run of 20 copies. I should emphasize that this effort was strictly a transcription of Joshua’s work, as opposed to a revision, rewritten or heavily edited version, done with as few editorial intrusions as possible, with changes made only for blatant errors that, presumably, Joshua would have been grateful to see eliminated. Regrettably, in the process of typesetting and laying out the text, other typographical errors have come into being. Most historical spelling and usage has been preserved. In many cases, large blocks of text have been broken into paragraphs to make it easier to read. I have also corrected some archaic misspellings and usage and very occasionally rearranged somewhat arbitrary headings and sub-headings into a more consistent and coherent order. This entry was posted on October 15, 2013 at 1:10 pm and is filed under Book Design, Books, Genealogy, Writing. You can subscribe via RSS 2.0 feed to this post's comments.